In the article, Bowden elaborates on the population decline that had plagued North Dakota for years, especially in its rural areas. It describes the state of the prairie, mentioning towns that “fall one by one like autumn leaves in the chill of October.” He paints a chilling and lonely picture, describing deer bones, rusting cars, and scattered remnants of human life. Of course, the photography accompanying the article just has to include a creepy picture of an abandoned doll staring through glass eyes covered with dirt and spider webs. There is nothing that speaks “despair” like a broken doll. It reminds me of Titanic documentaries I’ve seen. The article also mentions Epping, a tiny town in western North Dakota, which then had a population of 75 according to the article. Ironically, Epping is located only about 20 miles northeast of Williston, placing it right near the hub of the Bakken oil field. Today, I bet the residents of Epping would have something different to discuss besides the emptiness of the prairie around them. An especially interesting quote in the article reads, “That’s the rub of rural North Dakota, a sense of things ebbing, of churches being abandoned, schools shutting down, towns becoming ruins.” I look at the new students entering my high school weekly and new buildings popping up in Watford City daily, and realize just how ironic this article really is. The article does mention oil resources, but it was printed before our oil boom really took off, so author Bowden could not have realized just how wrong he was about to be. It’s not even that he was “wrong.” There are abandoned farmsteads scattered across the prairie across the Midwest – they are one of my favorite photography subjects. I’ve always been fascinated with the dreams left behind by homesteaders. It’s also true that our population was on the decline for years, especially among young people entering the work force. But I just love the irony of this article: our area of North Dakota, a state barely on the map until recently, is not exactly empty anymore. 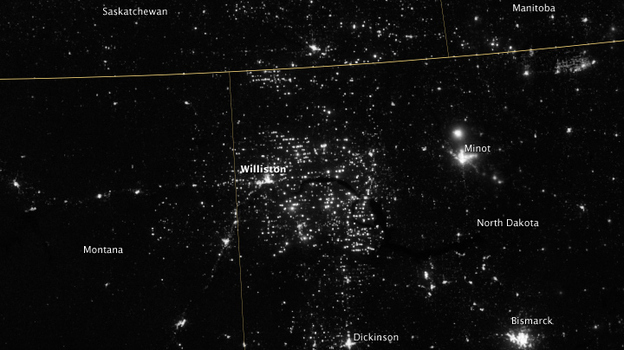 In fact, western North Dakota has made it onto a much bigger map: the famous satellite light map. Some of you may have seen this before. It’s a pretty cool satellite illustration of urban areas at night. The area in and around North Dakota used to be quite dark, considering it was, well, rather empty. Fargo had a sort-of bright spot. Minneapolis-St. Paul was probably the closest thing to an actual bright spot. 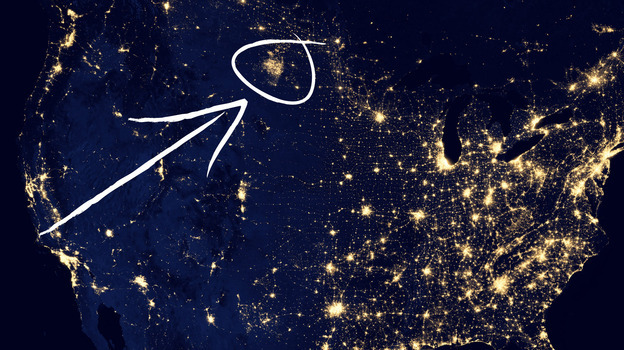 But NPR’s website recently published a piece called “A Mysterious Patch of Light Shows Up in the North Dakota Dark.” The satellite light map now shows a noticeable bright spot right in western North Dakota. Unlike other light patches, this one is made not of city lights but oil activity, particularly rigs and flares. These two articles show two very opposite sides of western North Dakota: the first, the fearful isolation of a deserted prairie, and the second, the overwhelming activity created by progress. The most ironic thing is, these articles are only a few years apart. Who would have known that “empty” could change so fast? You can find the original National Geographic article here. And the original NPR blog here. In 2004, the state champion speaker in speech to persuade spoke to the young people of North Dakota and bid them to stay. I remember this article and the legitimate concerns people had for the outmigration of the state’s youth. Last year, when I assigned a research paper to my junior highers about whether the oil was/is ultimately more positive or negative to the state, I recounted this concern. My students all looked at me as if I had told them I was an alien. It is truly amazing how so much can change in such small pockets of time. Can I subscribe to your blog? If so, how? Thank you!